With each passing day, more and more of us are awakening to the reality of extraterrestrial life here on Earth. Here at CE, we are attempting to bring you crucial and legitimate information regarding the implications of this phenomenon and what this means for humanity going forward. While I cannot say with absolute certainty that the races described in this article are indeed active and catalogued, I believe it is time for us to start taking the next step, moving beyond the reality of UFOs and extraterrestrials into the next stage of questioning. The evidence to support the reality of extraterrestrial life is overwhelming, but it has not been easy to identify the different races that have been visiting planet Earth for quite some time. Worldwide UFO sightings continue to persist and have become increasingly bold in their displays, almost as if those responsible are gauging our response to their presence. An avalanche of testimonies from high-level military and intelligence officers, astronauts, physicists,senators, whisteblowers, contactees, abductees, and those with genuine experiences continue to bring forth the most compelling evidence about human-extraterrestrial interaction, some of which is actually taking place with our governments in secret. Furthermore, leaked classified documents and political cables also confirm that extraterrestrial life is well known within the corridors of power and influence. World leaders and virtually all US Presidents have known about it for more than half a century, although they have kept this knowledge from the public for many reasons. 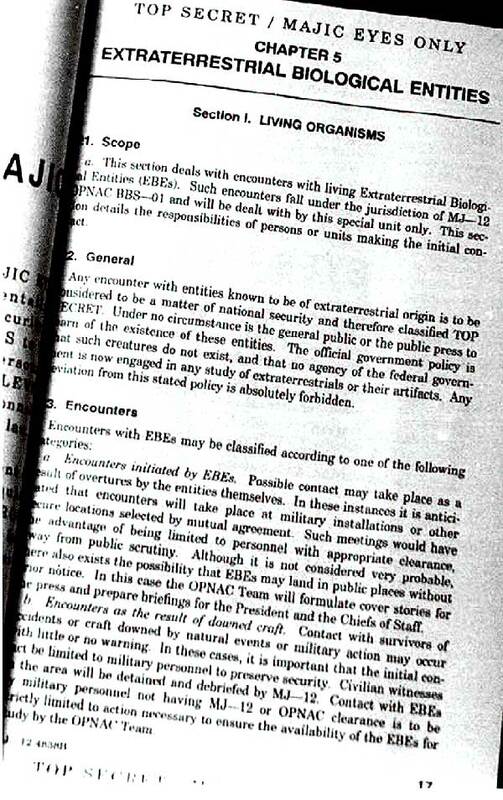 For example, the image below is from (what I believe to be) a genuine Majestic-12manual that states in no uncertain terms that the public is never to learn of the existence of extraterrestrial beings. While this continues to be the policy today, it is vitally important that we are informed about these matters for they are having a much larger impact on our world than we may realize at first. The Majestic 12 documents have been the subject of great debate among UFO historians, if you’ve never heard of them we encourage you to research the topic. The documentation has been leaked, and many historians attest to their legitimacy. MORE EXPLANATION OF DEEP UNDERGROUND BASES, MILAB, BLACK OPS, NIGHTMARE HALL, M.I.E.C.